Great version of trivial persuit. 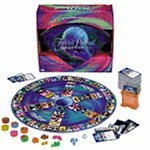 For the true Trivial Pursuit connoisseur! This fantastic version of the tremendously popular original celebrates the facts and follies of the past 1,000 years. Moving around a circular track, players collect wedges for correct answers to questions such as: What island do most of the North Atlantic icebergs come from? What South African described meeting the Spice Girls as one of the greatest moments of my life? How many men have walked on the moon? The remaining 3,597 questions (including those on 105 full-color photo cards) are housed in a collectible wedge-shaped tin package (10 inches by 13 inches)--along with the folding game board (18.5 inches in diameter), die, colorful transparent card holder, scoring wedges, and wedge holder. Players make their way to the hub through six categories of queries in hopes of answering the game-winning question. Don't wait till the next millennium for fun like this! For two to six players or teams.